Well, isn't that a co-incidence ! I doubt if there is any competition, since BootChess ( or here ) is only 487 bytes in size, and " doesn't do" castling, and is fairly lax on applying chess rules ! Created in homage to the ZX81 chess games of the early 80s, it is an attempt to create the smallest chess-playing code and demonstrate optimisation in coding, using assembly language. I tip my hat to the guy, since I only did assembly language coding once, back in 1984, when learning the basics of programming. I have never had to do it for real, and for that I am truly grateful ! I suspect that Bootchess vs Stockfish would a foregone conclusion, but it might be fun trying to play Bootchess just the once, although it would take me a while to work out how to compile it ! See the BBC for the full story, or ArsTechnica for a more geek view. T63 is still running, but for playoff qualifiers only : the main show is over, but the encores are about to start, so to speak. Since both teams I am involved with didn't make the playoffs, ( though in both cases only just falling short ! ) here's the breakdown of the season in openings so far in TL chess. 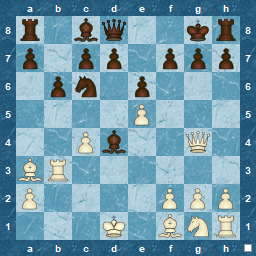 It is hard to put things any differently than previous posts, since both the Sicilian and French Defences remain top choices for Black against the main White start of 1.e4. ( In fact, 485 games start with e4 vs 308 with d4 ). The remaining openings jostle for position in the runners-up enclosure, but are usually in the same proportions, except that this time, the Spanish (Ruy Lopez) has stormed into 3rd place. Makes one wonder what happened in the last few months. New book or DVD on the Spanish ? Major victory by a super GM ? Time warp back to 1914 ? Regardless, a classic opening is back for a while ! Other openings just after the top 10, and in double figures for games played, are the Dutch, Centre Counter, Slav, Nimzo-Indian, Pirc, Grünfeld, Philidor, Italian, Benko Gambit and Guicco Piano. You could probably say that second slice of openings is a 50/50 split of e4 vs the rest, so e4 is definitely taking the lion's share of the attention.